We held our Annual General Meeting on Tuesday 24th April 2018. (Please visit the minutes section on this website for copies of the minutes of our meetings). Our keynote speaker at the AGM was a representative from Police Scotland, who introduced information about the community charity I am Me and in particular their Keep Safe initiative designed to support those who may feel scared or vulnerable when out and about in the local community. Keep safe places are identified, checked by Police Scotland and staff receive training about the programme. We are now working with the Local Co ops in the area to develop this work further. We held our open meeting on Tuesday 20th February 2018 in the Red Cross Centre in Golspie. Our speaker at this meeting was Anne Macdonald from Highland Senior Citizens Network. December 2017 saw the launch of our new foot awareness and nail cutting service in central Sutherland. Initially this work will be carried out in the Bonar Bridge, Ardgay, Rosehall and Lairg area, but in 2018 (funding dependant) we hope to extend the service to cover all of East and Central Sutherland. Sutherland Care Forum and Highland Hospice are working together to deliver support to people affected by a palliative diagnosis in East and Centre Sutherland. This will mesh perfectly with the Forum`s established service, Friends at Home, which offers regular visits to help isolated people attend appointments, help with small tasks, go shopping, take part in social activities. 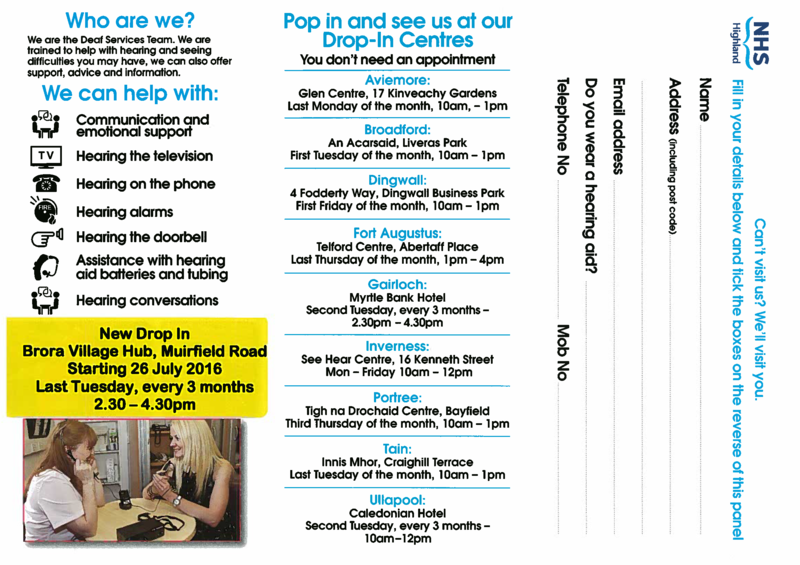 The Forum also have volunteers who can make daily telephone calls to check on well being and discuss any anxieties. New!. 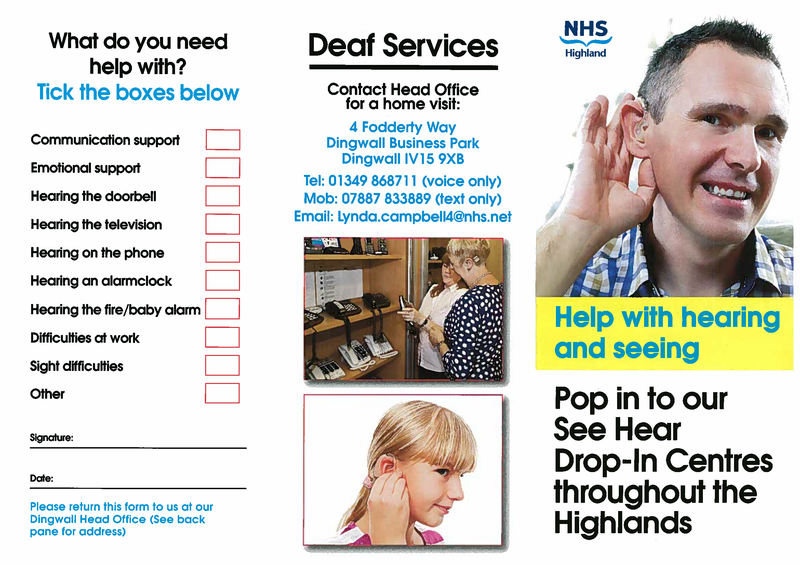 Deaf Services at Brora Hub ...here is their leaflet for information.